Carl was born in 1916 in Vanceboro, Maine, to Daniel and Izetta Hanson Alexander. Carl’s father, Daniel Alexander, worked for the Central Maine Railroad in Vanceboro, a small, community-oriented town. Alexander’s younger sister, Iris “Peg” Bailey recalls her mother generously welcoming weary railway crews into their home when they had nowhere else to stay. 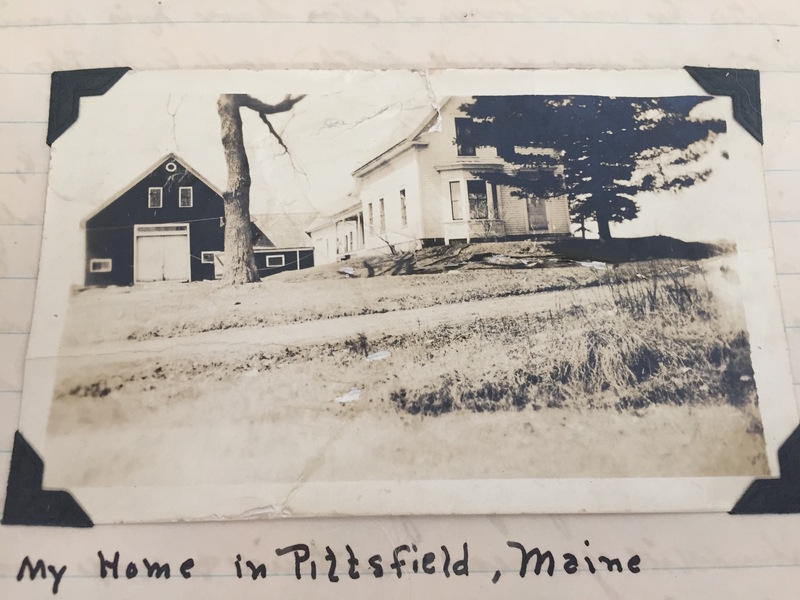 In 1932, 16-year-old Carl and his family moved to a farm in Pittsfield, Maine. Carl most likely left high school after leaving Vanceboro. Carl’s eldest sister, Glennie, was a nurse and died of tuberculous in 1940, leaving behind a daughter who came to live with the family in Pittsfield. Peg remembers her older brother’s humor and kind demeanor when he played with his younger sisters. She described him as a “wicked tease,” recalling stories of Carl teaching her to drive. 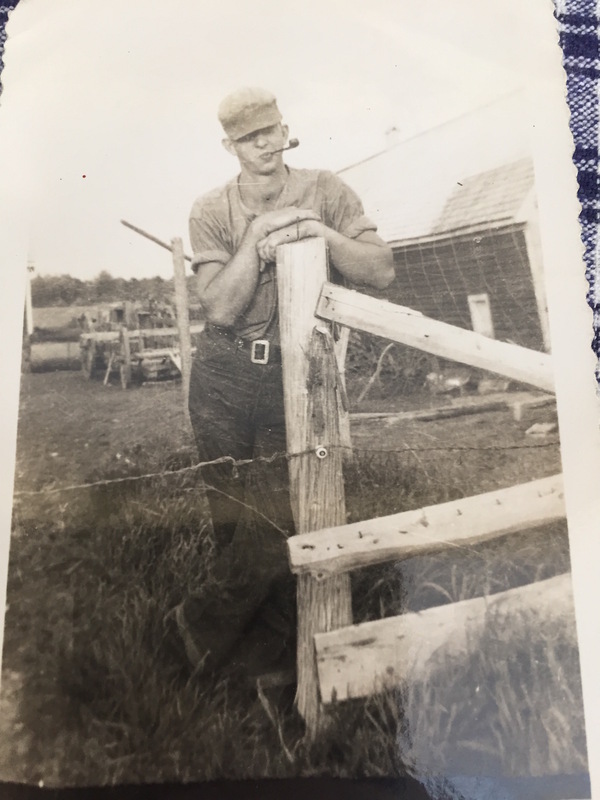 He worked hard on his family’s farm in the wake of his father’s death in November 1942. 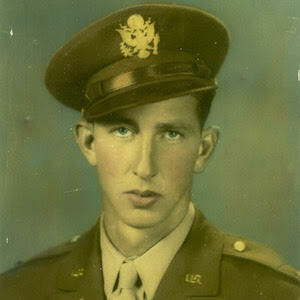 Alexander enlisted in the U.S. Army on March 20, 1941 in Portland, Maine. According to Peg, he enlisted during peacetime to earn money and to see the world beyond Pittsfield, Maine. Southern Maine transformed from small fishing towns to busy naval shipyards between 1941 and 1954, and the population grew by 10,000. Shipyards employed over 30,000 people. The war pulled Maine out of the economic decline and provided employment opportunities. The South Portland Shipbuilding Corporation, known as West Yard, began operation in spring 1941. The West Yard built over thirty ships in 466 days. The Todd-Bath Iron Shipbuilding Corporation, also known as East Yard, started in December 1940. On April 1, 1943 Todd-Bath and South Portland yards were combined to create the New England Shipbuilding Corporation, which operated until the end of the war. During World War II, the shipyards produced 266 Liberty ships for the war effort. Farming, a common practice among rural Mainers was northern Maine’s most profitable industry. During the war farmers were expected to increase production although there were fewer workers available because so many young men had enlisted. The food was needed to support troops and the Allied population in Europe. Glennie, Alexander’s sister, walked across the Canadian-American border to buy bulk packages of flour and sugar that she was unable to buy for the family in the U.S. because of rationing. Glennie hid the sacks in her shirt so that border control would not confiscate them. Alexander served as a member of the 28th Infantry Regiment, 8th Infantry Division, Company A. Alexander’s older brother, Bob, had enlisted in the U.S. Army several years earlier and became a paratrooper. Military service was very common in their community and family. 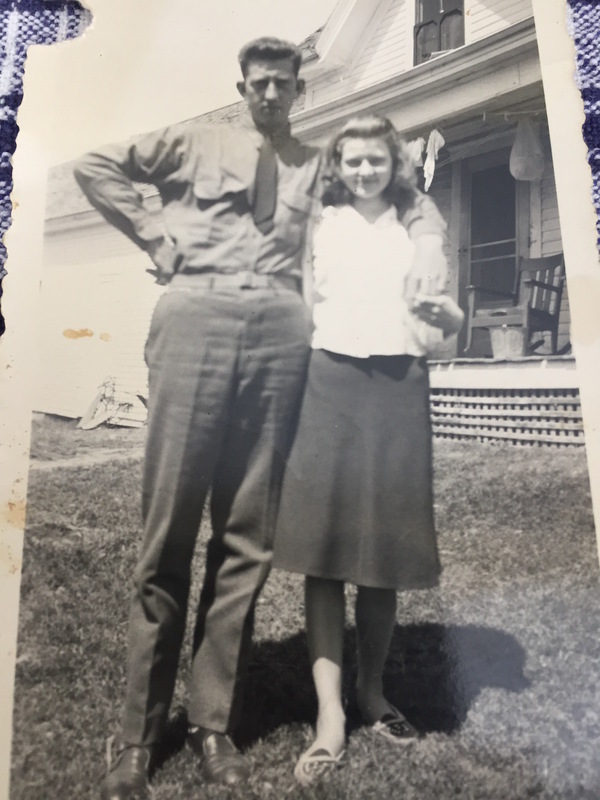 Carl’s younger sisters both married U.S. Marines in 1942 who served in the war. Peg recalled a friendly competition between her brothers, both of whom joined during peacetime. Alexander trained at Camp Crowder, Missouri, where he met his wife, Evelyn Adelman. They married on September 13, 1943 in Pittsfield, Maine less than a year before his death. A few months later he transferred to Fort Benning, Georgia, where he assumed his duty as a platoon leader. In early 1944, the 28th Infantry Regiment moved to England for further training, and on July 4, 1944 his regiment landed on Utah Beach. Alexander’s unit saw combat in the hedgerows, and approached the city of Rennes on July 13, 1944. The men received word that they would soon be relieved. On July 13, the 28th Infantry Regiment took part in an attack on a German ammunition dump when an enemy shell wounded another officer. Alexander carried the wounded officer to safety, and continued to organize his men when he was hit by a second shell. Knowing that his wounds were fatal, he refused aid and encouraged medics to save the other officer, He gave instructions to his platoon to finish the attack and died moments later. Upon Alexander’s death his mother, Izetta Alexander, received a telegram. 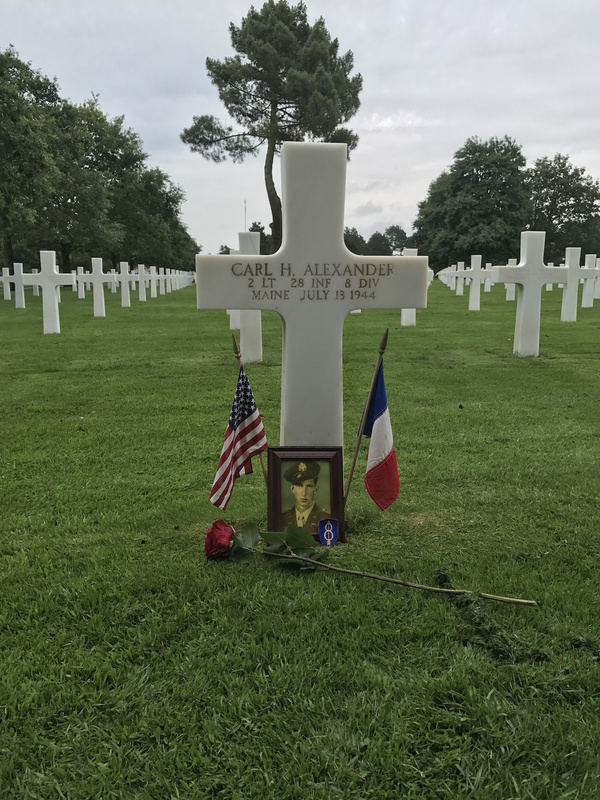 There was discussion of repatriation, but Alexander’s brother Bob, a paratrooper in World War II, decided he would be laid to rest in the Normandy American Cemetery with others who served by his side. Growing up in rural Maine, Carl Alexander likely never imagined being part of the liberation of France. At the age of 28 Second Lieutenant Alexander landed on Utah Beach and earned the Silver Star and Purple Heart. I had the opportunity to speak with Second Lieutenant Alexander’s sister, Peg. She remembered her brother with great admiration. He worked hard on the family’s farm and pampered his younger sisters, telling them stories about his boyhood adventures (many of which were exaggerated, as older siblings often do). To his mother’s dismay, he enjoyed smoking a pipe. Second Lieutenant Alexander enlisted in March 1941 in Portland, Maine. He may have seen enlistment as a new adventure while simultaneously defending his country. 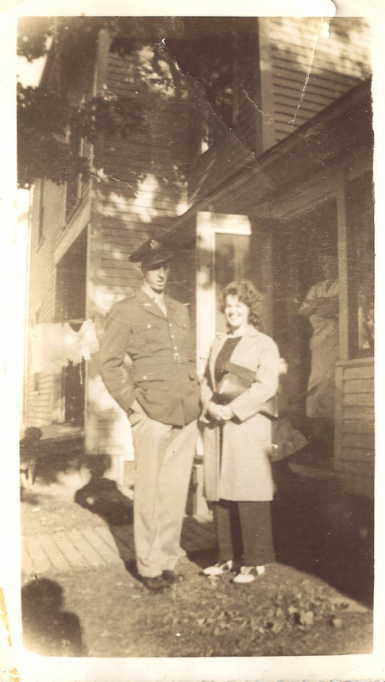 Second Lieutenant Alexander trained at Camp Crowder, Missouri where he met his wife, Evelyn Adelman. The two were married on September 13, 1943, in Pittsfield, Maine less than a year before his death. In early 1944 the 28th Infantry Regiment was sent to England for further training. On July 4, 1944 his regiment landed on Utah Beach. On July 13, 1944, after five days of combat, Second Lieutenant Alexander was killed in an attack on a German ammunition dump. His act of selflessness saved lives and enabled his men to finish the attack. Unfortunately, no matter how much research I did, I will never truly know Second Lieutenant Carl Alexander. I will never be able to fully understand his experiences. However, I appreciate his sacrifice. The bravery demonstrated in the face of adversity gives me a greater sense of who he was. It has been an amazing privilege to learn and tell the story of Second Lieutenant Carl Alexander. His story serves a reminder of the sacrifices made on the days of the Normandy Invasion. The research of the life and sacrifice of Second Lieutenant Carl H. Alexander was truly an unforgettable experience. Not only have I learned about an individual’s sacrifice, but also the effect of this individual in the grand scheme of the entire war, and how to apply the same compassion I feel for Alexander towards each individual story I hear. I cannot fully express what this opportunity has meant to me. I feel so fortunate to have spoken with Alexander’s sister, Ms. Iris “Peg” Bailey, and to have the resources that I did to piece together the aspects of his life. I stood on Utah Beach on June 24, 2017, almost 73 years after Alexander. For me that was a moment in which all the pieces seemed to fit together, I had learned about the broader context of the war, of his early life, training, and ultimately the end of his life. Standing on Utah Beach I could imagine him as he was, a real person. He was not as much of a mystery anymore, because I was able to associate all the personal aspects of his life with his heroic sacrifice. I am mindful of Alexander’s sacrifice, in every sense of the word, and as I continue to study World War II I will remember his sacrifice. Someone who grew up only 40 minutes from me, who had younger sisters, and loved his family. This someone was extraordinarily brave, this someone was Carl Alexander. This person who sacrificed his life for freedom is also someone who had a life at home. I think that this is a really important aspect to remember about every individual when looking at the broader context of the war. Alexander Family Photographs. Courtesy of Iris “Peg” Bailey. Bailey, Iris “Peg.” In person interview with the author. February 27, 2017. McGowen, Jean. In person interview with the author. February 27, 2017. Carl Alexander, Official Military Personnel File, Department of the Army, RG 319, National Archives and Records Administration - St. Louis. Carl Alexander, Individual Deceased Personnel File, Department of the Army. Maine. Somerset County. 1940 U.S. Census. Digital Images. http://ancestry.com. “2nd Lt Carl H Alexander.” Ancestry. Last modified July 3, 2014. Accessed February 8, 2017. "Carl H Alexander." Honor States World War II Casualty. Last updated December 30, 2016. Accessed January 17, 2017. http://www.honorstates.org/index.php?id=59580. Beem, Edgar Allen. “World War II left a big footprint on Casco Bay Islands.” Island Journal. Last updated 2015. Accessed March 13, 2017. Macgregor, Harold. History of the 28th Infantry Regiment. Washington D.C.: Infantry Journal Press, 1947. Tanguay, Tom. “South Portland Shipyards of WWII.” Roots Web. Last updated May 2, 2002. Updated March 13, 2017. http://www.rootsweb.ancestry.com/~mecumbe2/lighthouses.html.